Is the U.S. Secretly Welcoming Increased Russian Syria Involvement? In Syria apparently there are four or five fighters trained by the United States who are actually fighting. It seems a rather ridiculously low number, as supposedly the Obama strategy was all about training local fighters. There was supposed to be I guess at least more than 5,000 at this point. And 5,000 is a far cry from four or five. That number came out in committee hearings in Capitol Hill the other day. Now joining us to try to make sense of just what U.S. foreign policy in Syria is is Larry Wilkerson. He’s the former chief of staff to Colin Powell, and he’s a regular contributor to the Real News. Thanks for joining us, Larry. 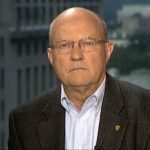 LARRY WILKERSON, FMR. CHIEF OF STAFF TO COLIN POWELL: Good to be with you, Paul. JAY: So what exactly does the United States want in Syria? We’ve been saying on the Real News what they generally seem to want, because I think this is what Israel wants, is they want both sides to keep fighting and killing each other. We’ve heard various people articulate this openly. We’ve heard it from various of the Israeli pundits. We heard it actually even from Donald Trump in the debate Wednesday night where he said let them all just kill each other. That seemed to be really what the policy was. Now, but with the growing strength of ISIS and Al-Qaeda type forces, the Russians apparently strengthened their support to Assad. They’re going to have a somewhat more involved military involvement in Syria. Why wouldn’t the United States actually want that if they really want ISIS and Al-Qaeda defeated? I mean, how is Assad the big problem here in terms of American foreign policy? WILKERSON: Let me describe what I would hope is happening. But I won’t in any way assert that it is happening. And I’ll say, open parentheses, I really don’t think this administration has a policy or a strategy, close parentheses. That means it’s just going from day to day. But what possibly could be happening is this. First of all, the administration confronted enormous challenges here because one of its principal allies, Saudi Arabia, and other members of the Gulf Cooperation Council are actually supporting and funding some of the most radical elements in Syria. So you’ve got that challenge at the beginning. You also have a NATO member, Turkey, and the leader of that NATO member, Erdogan, vigorously pursuing a policy vis-a-vis Syria that is antithetical to U.S. interests and to the interests of Syria as a state, if it can still be called a state. So you have some enormous challenges, and I didn’t even talk about Iran and Hezbollah, the most effective fighting instruments, as I see it, in Syria right now and mostly working for Assad. At the same time, they’re fighting similar elements of Daesh, ISIL, ISIS, whatever you want to call them, that are in Iraq, realizing that the core element within ISIS, ISIL, Daesh, are the Sunnis we disenfranchised, disempowered in Iraq, and forced to go onto the battlefield again. This is a very complicated situation. I think what I would like to see happening right now, and I do hope the administration is secretly doing this, much the way it started out the secret negotiations with Iran. We’re dealing with Moscow and with Ankara, and Tehran, on the basis of okay, what can we do, each of us, that won’t look like it’s coordinated, at least not initially, until we achieve success that will achieve an interim political solution and we all admit Assad has to stay around, at least for a time, for that interim political solution. We want to stop the killing. We want to stop the now increasing destabilization of some key allies by all these refugees that are heading out of Syria. We want to get the situation under control, stabilize it, and somehow turn it around so it’s more positive. It also will impact Iraq. It will impact Afghanistan. And ultimately it will impact this growing rapprochement with Iran, which can handle a lot more of these problems. So I hope that’s what’s happening. I hope Tehran, Ankara, Moscow, and Washington are all talking in this vein. I recently had an opportunity to talk to a person at the secretary of state level, on that floor, who indicated to me that that might possibly be going on. I hope it is, because that’s the only way we’re going to stop this. And they can’t put a public circus on it, just like they couldn’t put a public circus on the closed talks with Iran that Bill Burns was conducting originally. They have to do this in secret, and I agree, because there’s so many morons in my political party. People who are not interested at all in the national security of this country, but only in their own political power and the advancement and increase thereof, that they’ll throw it all in a cocked hat in a heartbeat. They’ll ruin it. So I hope that’s what’s going on, Paul. JAY: So you’re sort of suggesting that perhaps there might even be tacit approval of the Russians supporting, increasing support for Assad. But rhetorically, especially for domestic public opinion because of the Republican position, the Obama administration has to sound critical of it. WILKERSON: Yes. And you have to think too that, you know, in the back of the mind if you’re President Obama and John Kerry and Ash Carter, you’re thinking well, now, if the Russians put naval infantry and helicopters and tanks and so forth in Syria, they don’t have them to put in Ukraine and the Baltic states and other places where they might be a little more [anemical] to our interests. So I mean, this is crafty stuff, if it’s happening the way I hope it’s happening. 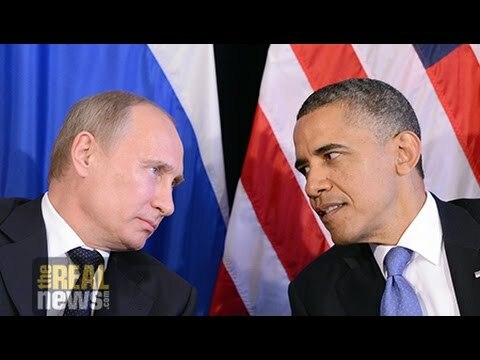 JAY: The Republican debate and the rhetoric coming out of the Republican candidates, more or less has Russia as the number one foreign policy enemy of the United States, actually, more than ISIS or anything else. Which also leads to why they think over, seems to think overthrowing Assad’s more important than anything else. How much do you think this is rhetoric and how much do you think if these people actually were in the White House they would be–they would actually take action on this Russian front? WILKERSON: You’ve got to have a bugaboo. If you’re a Republican and your national security bonafides are in question for the first time for 30-plus years, you’ve definitely got to have a bugaboo. You throw out China, you throw out Russia, you throw out ISIS, you throw out everything you can possibly throw out. And that gets people scared, it gets your base all worked up. You exploit this politics of fear, which is a very powerful force. And you get more votes that way. Are there people in the Congress who really think that Russia is an enemy? Of course there are, because they haven’t left the Cold War. They’re still in the Cold War. They’d like nothing better than to have Russia loom back and be a big enemy again. Not satisfied with China, they want Russia, too. I mean, they don’t–they’ve never heard of the old theory of international relations called conservation of enemies. You don’t need more than you can handle at any given time. They love enemies. Everyone in the world would be our enemy if they had their way, because that way they could get their money that they need for the armed forces. They could get the money they need for all the programs they want to support that relate to national security. It’s that crazy, Paul. It truly is that crazy. That’s what happens when you become a national security state. When war and the trappings of war become your reason for existence as a national entity. JAY: The Obama policy seems to be the same, more or less, as the Israeli policy, which is let Syria be destroyed by many factions. Certainly Israel seems to like the idea that any time they want now they can go in and bomb trucks heading with arms to support Hezbollah in Lebanon. But is this sort of getting out of hand for them? I mean, do you agree with that as a premise, that this is in fact what the Israelis and the Americans have wanted so far out of the situation, which is just let them all kill each other for quite a long time? WILKERSON: Well, I just described to you what my wishful thinking is about what the Americans might really be doing. Now, as to the Israelis, I think the intelligence people for whom I have some respect, and the–well, let’s just say Mossad, Shin Bet, the MI5, MI6 equivalents, if you will. CIA, FBI equivalents. The people who really know what the threats are to Israel and have lived with those threats, some of them, for some time, they’re getting worried about it. They’re getting worried about it for a number of reasons, not least of which is chaos does not necessarily lead to a prosperous and sustainably prosperous Israeli future. Chaos could finally stumble over the border. It could stumble over the border in a number of ways, and it could bring some of the Daesh, ISIS type of operations to Israel. After all, the reason a lot of these people existed in the first place, and the reason they continue to have power, is because of their opposition to the Israeli position vis-a-vis the Palestinians and other Arabs in general in the region. Let’s face it, go back and examine some of Al-Qaeda’s fatwas, or some of their pronouncements, and you’ll see that that’s at the base of some of it. So I think the real people in Israel, that is the people who have national security as their daily profession, are growing increasingly concerned about what’s happening. And the refugee status, the destabilization of Jordan, the destabilization of Lebanon, I think I told you I recently had one of the royals from Jordan tell me that there was an Iraqi or a Syrian family in every single Jordanian home, or multiple families therein. This is very destabilizing. So that’s the peace treaty. Egypt and Jordan, and Jordan could unravel that at any moment. Egypt could unravel that at any moment. I don’t think this is a situation in which Israeli mid-term and long-term security is assured. And then you’ve got the additional problem of the two-state solution is dead. It’s completely dead, it’s in its grave. So what are we looking at? We’re looking at a one state solution. And on the one hand we’re looking at a theocratic state that increasingly is apartheid-like, and that increasingly is isolated in the international community and I’ll predict right here won’t last more than 20 years. Or we’re looking at a single state solution that is democratic, non-Jewish, non-theocratic, accepting of all the people within its ranks. Giving those people equal rights, [inaud.] rights and so forth. Having a decent labor movement. Being a real democracy. And a very different state than we have today. So I mean, I’m agreeing with the Ayatollah who said in Farsi, if it’s been translated properly for me, not that he wanted to see Israel disappear. He predicted the Jewish state as it currently exists will disappear. I think he used the term 25 years. I’ll predict it’ll disappear in 20 years, maybe 15. JAY: If you go through the kind of logic of people that can bomb Gaza and kill women and children as part of what they call mowing the lawn, or people have called it that, maybe it wouldn’t be so bad to have an ISIS threat on your border. The world’s getting a little bit disbelieving and tired of looking at the Palestinians as an existential threat to Israel. People I think are more or less over that Iran is an existential threat to Israel. Maybe it wouldn’t be so bad, if you want to maintain this kind of militarist, hyper-security state in Israel, to have an ISIS threat on your border and an endless war that can go on for who knows how many decades. WILKERSON: Well Paul, I mean–the real threat here, if there is a threat, is the civil war itself, and the destabilizing effects it has all around its periphery. And even now as we’ve seen, in the heart of Europe. I agree with Bill Maher. He had a chart when I was on his show three or four weeks ago, and a chart went up and he showed how there are 4.5-plus million men under arms in the states surrounding Syria. 4.5 million soldiers, heavily armed in some cases. And there may be 30 or 40,000 of these so-called ISIS, ISIL fighters. My goodness. They’re outnumbered enormously. Is this the threat it is pretended to be, or is it just that all these people won’t do anything about it? JAY: All right, thanks for joining us, Larry. WILKERSON: Thanks for having me, Paul.